Critics of the rule say it doesn't go far enough to ban the toxic material. The Environmental Protection Agency is moving forward on a proposal that would require companies to get EPA approval to manufacture and import asbestos, a move that officials say would "close the door" on uses for asbestos that could resume at any time under the current law. A rule proposed by the EPA says the agency has identified several areas where asbestos is no longer used, such as roofing materials, and would require that any company that wants to manufacture or import asbestos for that purpose has to notify the agency at least 90 days in advance. The uses for asbestos that the rule covers are not illegal. The EPA has banned some uses for asbestos, like spray-on insulation, but a ban on most products that contain asbestos proposed in 1989 was later overturned by a federal appeals court. Many companies voluntarily stopped using the products, but Nancy Beck, deputy assistant administrator in the EPA chemical safety office, said without the rule they could start using them again at any time. "We're really closing the door on those uses that are not happening now, but there's nothing preventing them from starting," Beck told ABC News. Beck said that even though asbestos is no longer used for things like floor tiles, wrapping pipe, or roofing materials there is nothing to stop companies from resuming using those materials that include asbestos at any time. "If somebody wanted to start doing it there's nothing preventing them. So we wanted to sort of look at the whole landscape and make sure that if anyone started a use we would be able to evaluate it," she said. But advocates say the rule still opens the door to give some companies that approval and that the EPA should ban asbestos completely because of the health risks. Breathing asbestos can increase the risk of lung cancer, according to the Centers for Disease Control, and people who work with asbestos are even more likely to develop lung problems. A campaign by the Environmental Working Group says that between 12,000 and 15,000 Americans die from asbestos-related illnesses every year. (Kristoffer Tripplaar/Sipa via AP) The exterior of the headquarters of the United States Environmental Protection Agency (EPA) in downtown Washington, D.C., April 2, 2017. That group also pointed out last month that a Russian company that is one of the world's biggest asbestos producers stamped President Donald Trump's face on its palettes of asbestos and posted on Facebook thanking him and former EPA administrator Scott Pruitt for excluding some uses of asbestos from the agency's risk assessment. Melanie Benesh, legislative attorney for the Environmental Working Group, said the EPA is not considering the impact of exposure to asbestos from old buildings or health effects other than cancer in its analysis under the toxic chemicals law passed in 2016. She said the EPA is behind other developed countries by not banning asbestos and that its a "very big public health concern" if the agency is limiting the scope of its risk evaluation in a way that makes it more likely to find less risk associated with asbestos. "Asbestos is a carcinogen regardless of whether it's in building material that was installed 40 years ago or whether it's in a newly manufactured product," she said. "Cancer doesn't distinguish between these two uses so when EPA is evaluating asbestos we think they should take a comprehensive look." On Tuesday, Chelsea Clinton tweeted an article about the EPA proposal in The Architects Newspaper that reported the EPA rule allowed asbestos in construction materials, which EPA spokesman James Hewitt said was inaccurate, commenting that the Trump administration is "making asbestos great again." Asbestos Disease Awareness Organization President Linda Reinstein tweeted that the proposal was "shocking" and "disgusting" and said it would increase asbestos imports to the U.S.
EPA officials pushed back on this criticism, saying that the chemical law passed in 2016 requires them to go through a risk evaluation process before they completely ban chemicals like asbestos. They said the rule does not encourage asbestos use at all but puts a rigorous review process in place where there previously wasn't any regulation. 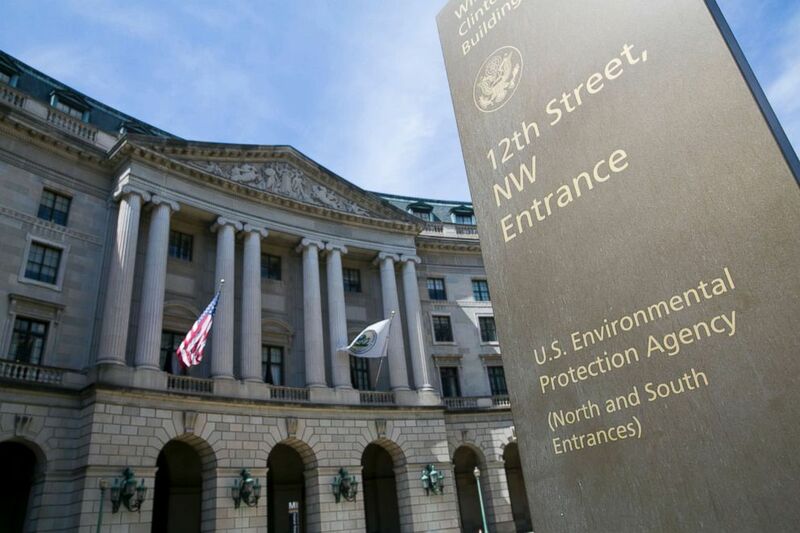 "The uses that are covered in the significant new use rule can come to market prior to the SNUR being proposed at any time with no knowledge, no evaluation," Charlotte Bertrand, acting principal assistant administrator in the EPA chemical office told ABC News. "The SNUR prohibits that from happening, it cannot happen, and if somebody did want to go to market they have to notify the EPA and EPA evaluates the use that is being proposed for human health, public health, and environmental risk, and then it enables an opportunity to impose restrictions, prohibit, or limit a use that could happen now." The full text of the EPA rule proposed on June 1 is available here for public comment until Aug. 10.